The DOW and S&P500 have been hitting all time highs this month. This has come on the back of a strong earning seasons and a generally improving economic outlook. It’s a similar story in Europe. The UK FTSE-100 is near a 14-Year high, and could well surpass that resistance this month to reach its highest ever level. Meanwhile, the VIX is showing declining volatility that’s highly characteristic of strong stock market rallies. 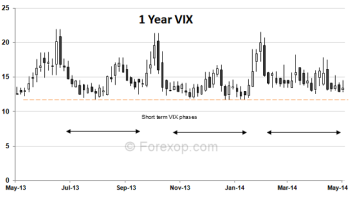 The VIX index, the broadest gauge of market risk, has a history of running in bipolar phases. The recent nadir in the VIX is concerning some analysts as this is traditionally a sign that investors have become “over confident”. Some analysts are questioning if the markets are becoming too complacent and this is a potential warning sign of increasing volatility to come. The VIX measures out the 30-day implied volatility priced into S&P 500 options – it historically bottoms-out prior to market corrections. While it might be too early to call a market top just yet, it’s worth looking at the VIX from a historical perspective. 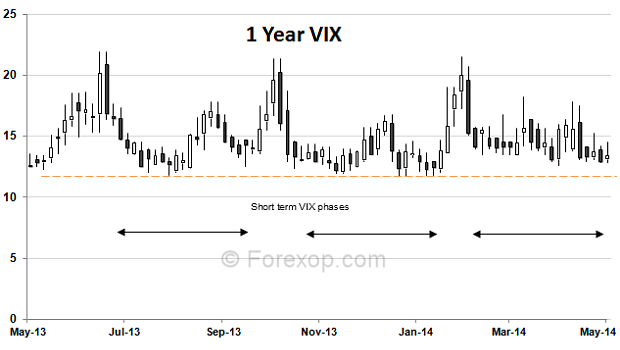 This week the VIX touched 12.3, a key support level. To put this into perspective, that compares to an average of 14.7 over the last 12 months and a lifetime mean of 20.6. The index reached 90 during the collapse of Lehman, which was its highest ever reading. The VIX has been in a long-term down-trend since that event. The recent nadir is concerning some analysts as this is traditionally a sign that investors have become too “risk tolerant”. Why is this relevant to currencies? The VIX, called the fear index by some, has a strong negative correlation with the high yielding currencies. When the VIX is high – risk averse – money tends to come out of the more risky currencies and flows back to defensives such as USD, CHF and JPY. As expected, we’ve seen strong performance on the traditional carry currencies over the last 6 months thanks to this improving risk appetite. However given the level of the VIX and the momentum in the stock markets, these positions should be closely monitored. This is also a good opportunity to prepare for event driven strategies on the back of unwinding risk positions.